We got like 2 kg of wonderful red bell peppers with a vegetable delivery a while ago. Organically grown of course, hopefully loaded with vitamins and fibers. The color or taste indicated that at least! Lately we have started to focus more on getting enough quality fibers in our daily meals to serve all the gut bacterias, I’ll come back to that in another post. 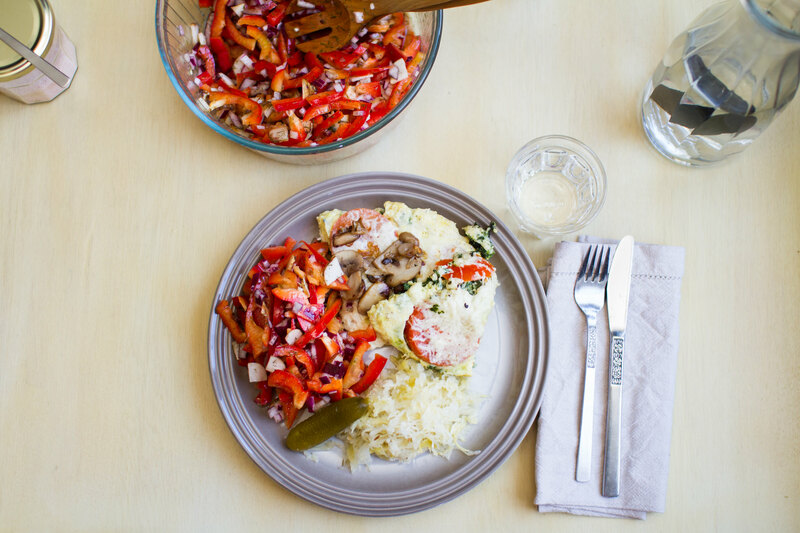 I looked for some inspiration of what to pair with the bell pepper and found out that the combination of dill and red onion would be really nice. It turned out fantastic, find the recipe below and make one yourself! Saturday lunch with raw bell pepper salad. 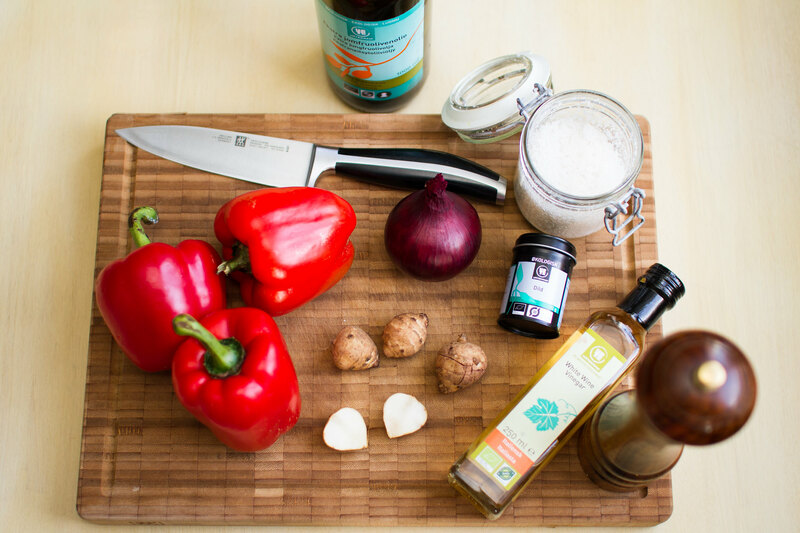 Ingredients used in bell pepper salad with dill, onion and artichokes. Chop all the vegetables in suitable sizes. Add in a bowl and add salt, pepper and dill. 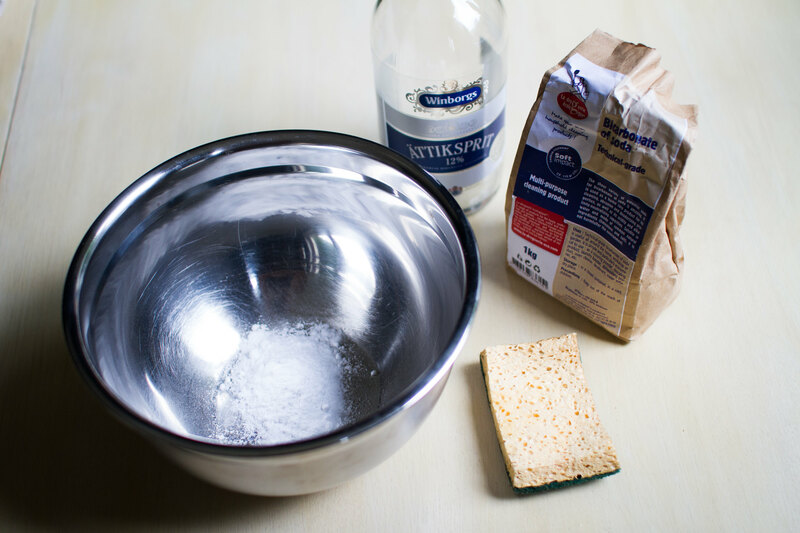 Sprinkle some white vinegar on top and cover with olive oil. For best result, let it rest for a couple of hours before eating to let the vinegar soften the onion and blend all the flavors nicely. 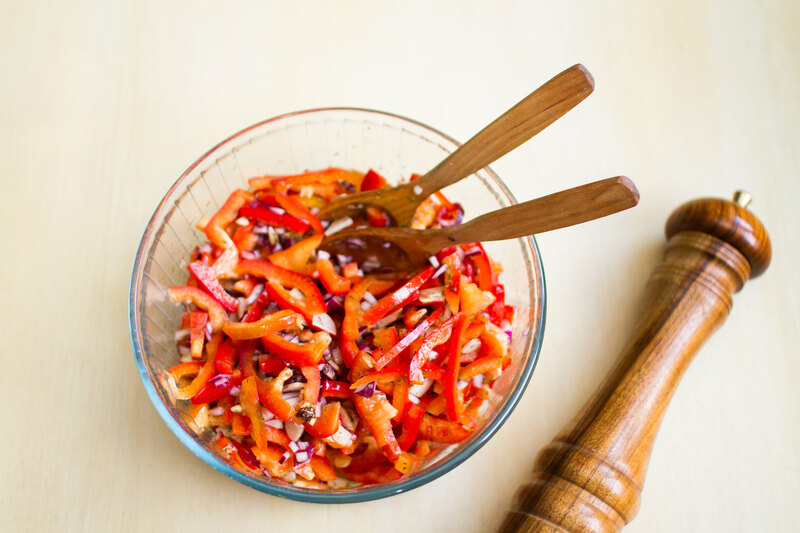 Lovely color of the raw bell pepper salad. I cheated slightly on the resting part though, but it was delicious anyway! The artichokes gives such a nice earthy flavor to the more sour onion and fresh bell pepper. For this Saturday lunch a while ago we had the salad together with a spinach and tomato frittata topped with pecorino cheese and some fried mushrooms and saurkraut. A satisfying weekend lunch. Living in the city, in an apartment together with two cats require quite a lot of cleaning. The amount of dust created is fascinating. Not to mention all the soot particles from the road outside… So every Sunday is cleaning day! It takes roughly one hour to do the whole procedure if we do it together, which we always try to do. It’s just too much to handle yourself. All the picture frames, book shelves, splines etc. 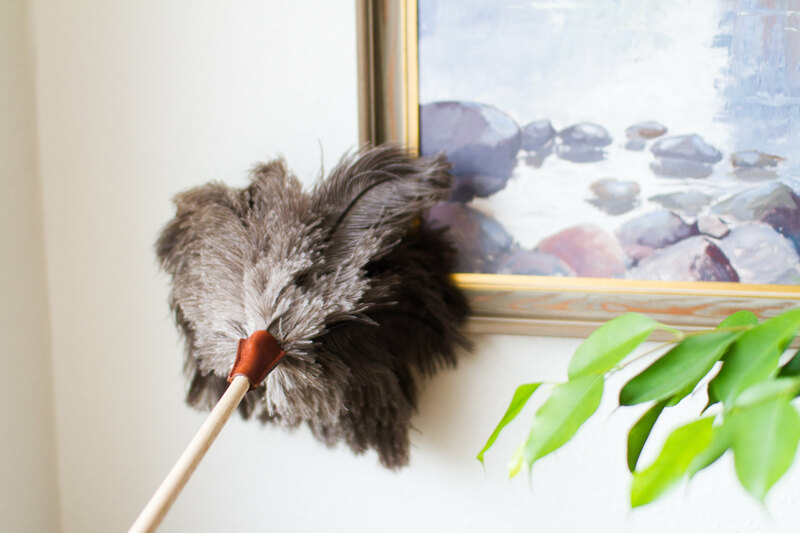 get free of dust with our awesome feather duster made from ostrich plume. Another reason that we clean the house so often is to get rid of all the dangerous particles coming from electronics and plastic in the home, even though we try to have as little plastic as possible but its hard to avoid electric leads for example. 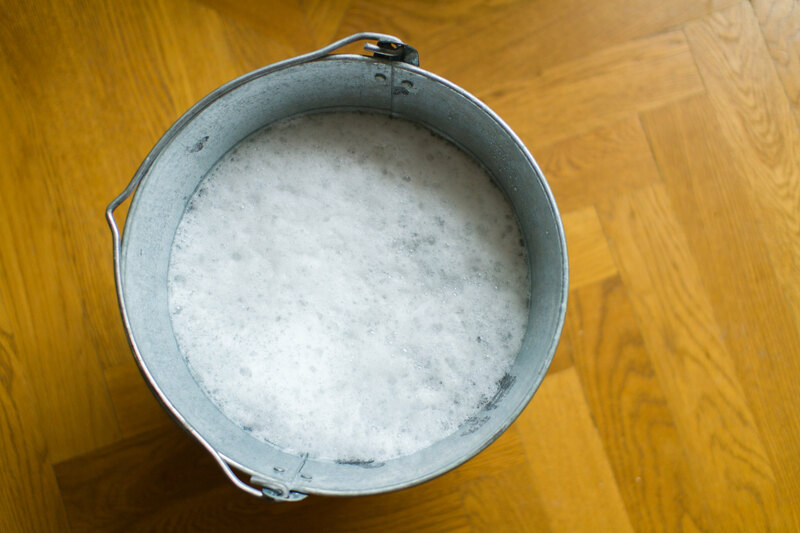 Therefore our cleaning equipment need to be made out of natural non-toxic materials as well. The vacuum cleaner… I don’t think there is a non-plastic available on the market. But what you can do is to make sure to have a good filter in it. Something that we don’t yet have bothered to research. Sorry for the boring picture but this is a very important tool for us, the cat hair remover! 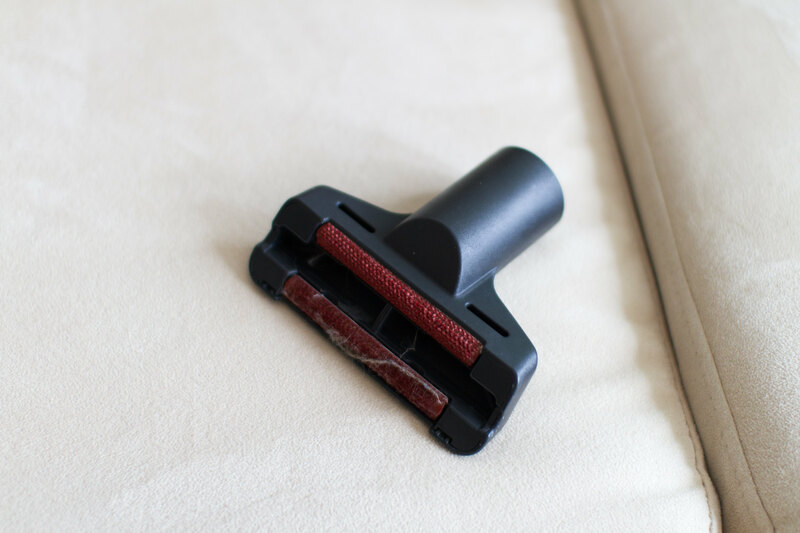 From all our furniture… It feels nice to get rid of all the invisible dust particles in the furniture as well. Soap made from left-over frying fat! The vacuum cleaner surely is a great thing, but it can’r do everything. 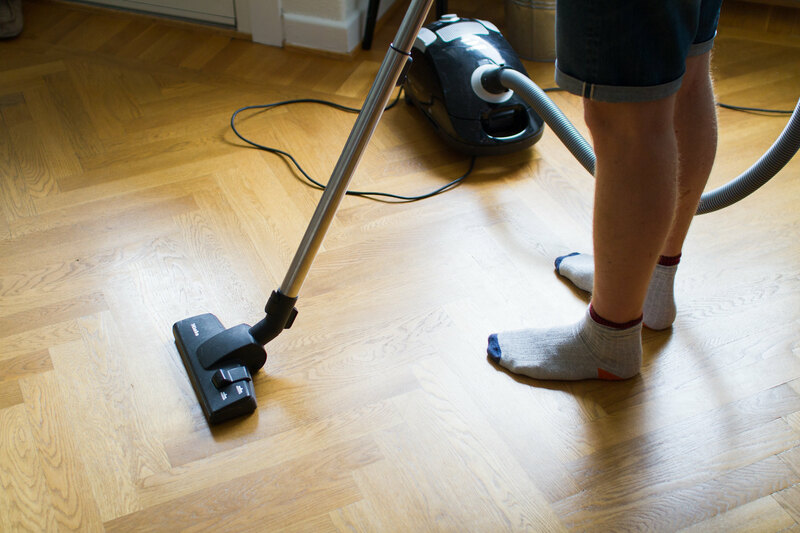 It does not take all the small dust particles away and obviously not the dirt from the floors. Therefore, it is important to swab the floors as well. We use a bucket of zink, a mop of yarn that unfortunately still contains some polyester. Some room for improvement there. The jar to the right contains concentrated soap made from left-over frying fat, nothing else! It’s made in the north of Sweden. Always try to buy things in its concentrated form, it’s so unnecessary to buy things with added water. 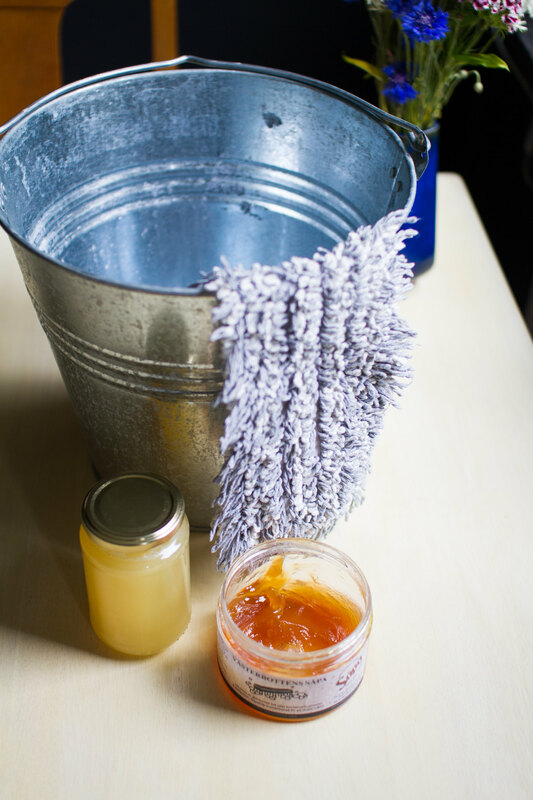 We dissolve the soap ourselves in a jar, just the amount we use for each cleaning. For the bathroom we don’t use any harmful chemicals either. It’s completely fine to just use white vinegar and bicarbonate of soda. Mix it with some hot water and clean everything in the bathroom with it. It should kill most of the bacteria and works really well on lime deposits. The chemicals to clean the bathroom. It makes no sense to clean your home with loads of chemicals and fragrances that are packed with hormone interfering stuff. If you believe it’s harmful for you to eat, don’t use it to clean with either.